Bunker Hill Village is one of the six affluent independent cities collectively known as the Memorial Villages. Central location: Bunker Hill Village is located in the westernmost portion of the Memorial Villages and has convenient access to both Katy Freeway and Sam Houston Parkway. Shopping and dining options: The Memorial City Mall and the CityCentre, along with several shopping and dining hubs, are located a few minutes from Bunker Hill Village. Award-winning schools: Bunker Hill homes for sale are zoned to the Spring Branch ISD’s top-ranked schools, including Frostwood Elementary and Bunker Hill Elementary, both located within the city. Elegant homes on large lots: As is typical for the Villages, Bunker Hill homes sit on sprawling lots ranging from half-acre to more than 80,000 square feet. Architectural styles vary, but most of Bunker Hill’s housing options do have something in common: elegance and luxury. With Bunker Hill Village’s great accessibility, plenty of retail and entertainment options, and excellent schools, it’s no surprise that it was included in Forbes’ list of Top Places to Live Well. Like the rest of the Villages, it is also one of the most expensive neighborhoods in the state of Texas. Contact Paige Martin, one of Houston’s best realtors and head of the Houston Properties Team for questions and advice about Bunker Hill homes for sale. I am interested in Bunker Hill and would like to get more details. Among the four villages located south of the Katy Freeway, Bunker Hill Village has Hedwig Village to the north and Piney Point Village to the east. Hunters Creek sits farther to the east, while Hilshire and Spring Valley are located north of the I-10. Some of Bunker Hill Village’s old ranch-style homes can be traced back to the area’s early history. During the 19th century, the area in which the Memorial Villages now sits was populated with farms, sawmills, and a few homes. In the 1950s and 60s, the Houston housing boom and the development of the Katy Freeway sparked interest in Bunker Hill and the rest of the Memorial Villages. In order to keep the area’s residential zoning and preserve the neighborhood’s tranquil atmosphere, Bunker Hill filed a petition and was incorporated in 1954 with a mayor-city council form of government. Today, Bunker Hill is an independent city that jointly operates the Memorial Villages Police Department with Hunters Creek and Piney Point. The Village Fire Department and the Memorial Villages Water Authority both serve the city. Despite being mainly residential, the city’s central location gives its residents excellent access to the area’s entertainment, shopping and dining options, as well as key Houston hubs like Downtown, the Energy Corridor, and The Galleria. 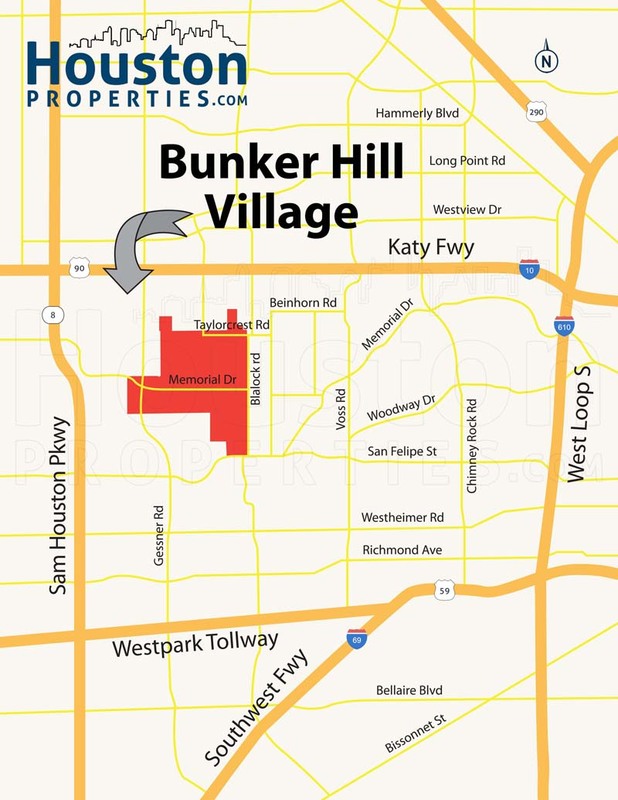 Bunker Hill Village is under the 77024 Harris County zip code. Zip codes near Bunker Hill include: 77007, 77008, 77019, 77027, 77042, 77043, 77055, 77056, 77057, 77063, and 77079. Neighborhoods near Bunker Hill Village include: Stablewood, Bayou Woods, Sandalwood, Energy Corridor, The Galleria, River Oaks, Camp Logan, and Timbergrove. With a total area of 1.5 square miles and no chance of expanding, real estate trends in Bunker Hill has taken a turn toward updating and tearing down old homes to build new ones. Like its fellow villages, this trend has caused Bunker Hill real estate to appreciate. Compared to Hedwig, Piney Point, and Hunters Creek though, Bunker Hill has marked conservative price increases. It is, however, still quite impressive when put side-by-side with comparable Houston properties. In the past decade, Bunker Hill homes for sale have steadily appreciated. The median sales price has increased from $1,175,000 in 2005 to $1,815,000 in 2014. This 54% change is similar to positive changes in average sales price per square foot and lot price per square foot, both posting 50% and 54% changes, respectively. Deed restrictions and zoning ordinances have helped maintain Bunker Hill’s look and luxurious atmosphere. Like most of the Memorial Villages, elegant single-family homes on large wooded lots are common. Ranch-style homes used to populate Bunker Hill, but most of them are being replaced with new construction custom-built manors with all the modern conveniences. 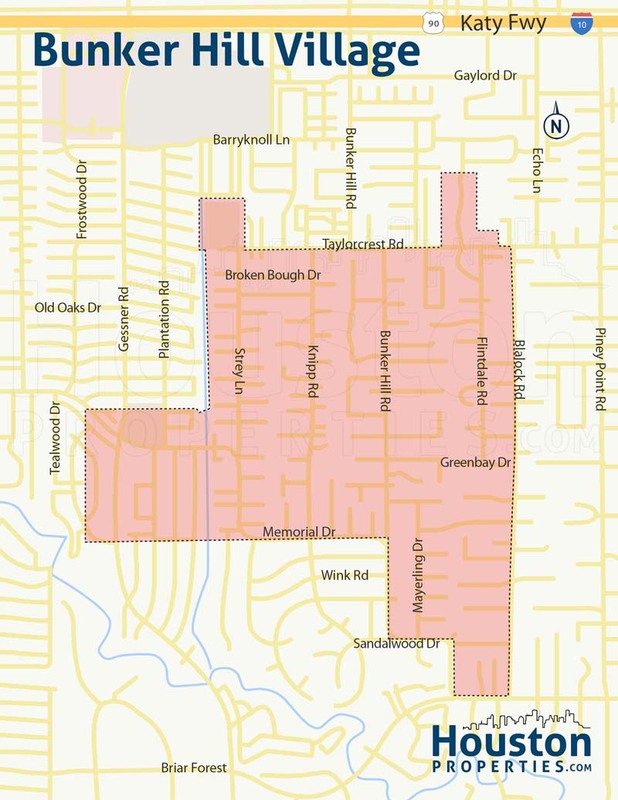 Bunker Hill Village is zoned to the Spring Branch Independent School District (SBISD). Wildcat Way School serves the entire neighborhood. A small portion of Bunker Hill Village is zoned to Memorial Drive Elementary School in Piney Point Village, while the rest of the residents are zoned to either Frostwood or Bunker Hill Elementary, both located within the neighborhood. For middle school students, Memorial Middle School serves the west portion of Bunker HIll, while the east is zoned to the Spring Branch Middle School. Wildcat Way School at 12754 Kimberley Ln. All Bunker Hill residents are zoned to Wildcat Way for early education. Located beside Bendwood Park and Bendwood School, it is easily accessible from Bunker Hill Village. Bunker Hill Elementary School at 11950 Taylorcrest. Bunker Hill Elementary is one of SBISD’s award-winning schools. It was recognized as a National Blue Ribbon School in 1991-92, and has an Exemplary TEA rating. It was also named a Gold Performance School and has a GreatSchools.org rating of 9 out of 10. Frostwood Elementary School at 12214 Memorial Dr. Recognized as a National Blue Ribbon School (1989-90, 2005), Frostwood serves students in grades K to 5. It is located within Bunker Hill and has a GreatSchools.org rating of 10 out of 10. Memorial Drive Elementary School at 11202 Smithdale Rd. Located in neighboring Hedwig Village, Memorial Drive Elementary serves students in grades K to 5. Like Frostwood, it was also recognized as a National Blue Ribbon School (1996-97), and has a GreatSchools.org rating of 10 out of 10. Bendwood Campus Elementary School at 12750 Kimberley Ln. Bendwood Elementary is located within a stone’s throw of Wildcat Way School and Bendwood Park. It is a special needs school with programs for children with disabilities (PPCD, or Preschool Program for Children with Disabilities). Memorial Middle School at 12550 Vindon Dr. Another excellent school from the Spring Branch ISD, Memorial Middle School was recognized as a National Blue Ribbon School in 1988-89. It features a great balance of academics and athletics programs, and it has a GreatSchools.org rating of 10 out of 10. Spring Branch Middle School at 1000 Piney Point Dr. Located in nearby Hedwig Village, Spring Branch Middle School is also a recognized National Blue Ribbon School (1997-98). It offers several electives, in addition to offering a special education program. Memorial High School at 935 Echo Ln. All Bunker Hill students are zoned to Memorial High School in Hedwig. It is considered as one of the best high schools in the area and has received numerous awards and recognitions. It was named an Honor Roll school, as well as a National Blue Ribbon School (1988-89). Bunker Hill Village also has easy access to some of the best private schools in the area. Listed below are some of them. St. Cecilia School at 11740 Joan of Arc Dr. Located in Hedwig Village, SCS is a non-profit coeducational school within the Roman Catholic Archdiocese of Galveston-Houston. The school’s curriculum centers of six core subjects (Theology, Mathematics, Sciences, Social Sciences, Literature, and English). The Kinkaid School at 201 Kinkaid School Dr. Kinkaid is one of the most prestigious private schools in the Memorial Villages. It was originally located in Houston, but later moved to a bigger campus in Piney Point Village. Duchesne Academy of the Sacred Heart at 10202 Memorial Dr. Duchesne Academy is an all-girls Catholic school and is part of the Archdiocese of Galveston-Houston and the Independent School Association of the Southwest. The school serves students from grades K to 12. To find an updated listing of all Bunker Hill real estate zoned to any specific public school, please send an email to Paige Martin at Paige@HoustonProperties.com with the property preference and budget that you’re working with. Paige works with a tremendous number of buyers and sellers in the Memorial area, earning praises such as “Paige Martin is the best Houston realtor I know”.